I am interested in duplicating the Atlanta Arms and Ammo 9mm 115 MATCH loading. Has anyone ran this ammo across a chronograph? It would be helpful. suggested 5.0 gr WSF should get you in that ball park. These are the top loads for accuracy in my KC built 9mm with a 1-32 twist barrel. All run about 1100fps. I'm loading WSF because that was the most available at the time. All 10 shot groups <1.5" several under 1" all @50yds. I ran the lot that I had at the time and got 1135 on a 10 shot average with an SD of 7. I received a new lot last week and I have not had a chance to see what it is doing but it feels lighter out of my hand and it prints slightly higher on paper. I hope that helps. Were they the 115gr FMJ's or the JHP (XTP) rounds? I know the FMJ are a little hotter than the JHP. The Atlanta Arms bullets were 115gr FMJ. The reloads were Hornady 115 gr. FMJ ENC. Just another random rumbling in the leaves between my ears. Besides matching the velocity, shouldn't you also be trying to match the pressure curve? I would think that if you matched the velocity with a sharp curve versus a flat curve, the shot would feel different. FWIW, I pulled the bullet from an Atlanta Arms 115 gr FMJ and measured the powder charge, on my digital scale it was 5.4 grs. I compared it visually to other powders I had on hand and it looked a lot like Power Pistol. Be very careful, as reloader's we need to error on the side of caution as looks can be deceiving, the powders that most factories use are proprietary compounds and not available as canister powders for reloading. Sorry, I'm to old to try and write things from memory. It was an Atlanta Arms 115gr JHP that I checked and 5,2 grs of powder. The 5.4 load was a .45cal Federal 185gr JSWC, still don't know what powder that was. I am planning on loading 5.7 grains of Power Pistol. I hope it works out. ANDYZ28 wrote: I am planning on loading 5.7 grains of Power Pistol. I hope it works out. What kind of pistol and barrel, including twist rate, are you shooting? 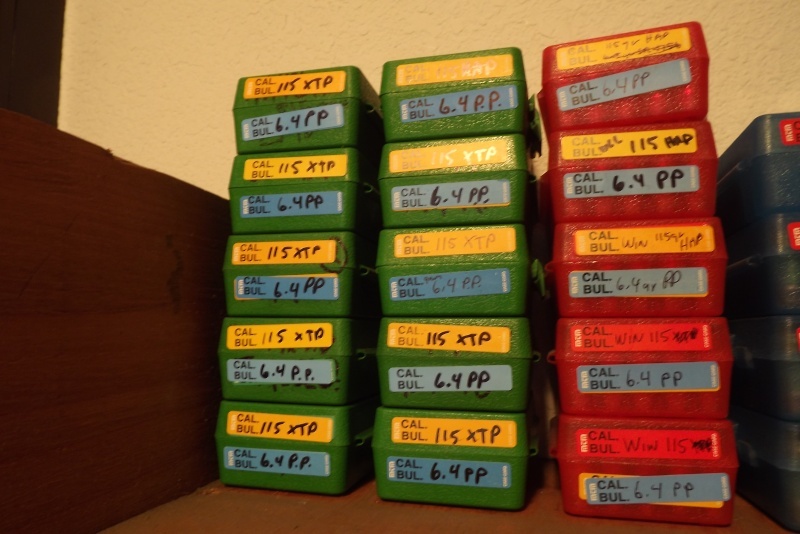 Or, find a published load of 1100 fps and 5.4 gr's of somethin' and you might be there. It is a Beretta 92 accurized with a BarSto 9mm P barrel. It is on loan to me. ANDYZ28 wrote: It is a Beretta 92 accurized with a BarSto 9mm P barrel. It is on loan to me. I could have sworn somebody here broke apart some AA 115 gr. stuff and/or talked to AA and stated it was WSF powder? Maybe JPGOV? robert84010 wrote: I could have sworn somebody here broke apart some AA 115 gr. stuff and/or talked to AA and stated it was WSF powder? Maybe JPGOV? Ive talked to them and many other ammo manufacturers and they wont tell you what powder they use, couldn't even get Winchester to tell me what was used in the 185 fmj target ammo they hadn't made in 10 years, ... and most commercial reloaders use blended powder that is made just for the application they want rather than off the shelf brands. I have spent quite a bit of time researching this topic, and the data is all over the place. 6.7/115 seems to be the most popular but it really fills the case up. I am going to take some advice from here and load to 6.0/115. I guess my original idea of chronograph the AAA ammo then work it out from there. The ammo does not seem too hot to me. ANDYZ28 wrote: I guess my original idea of chronograph the AAA ammo then work it out from there. The ammo does not seem too hot to me. This is not a hot load. Their 115gr JHP (Hornady XTP bullet) chronos at 1100fps I bought 1,000 rounds to test & shoot while I developed a duplicate - see my post above. The FMJ round does feel a little hotter. OK, here is what I have discovered. First of all, the ammo used by the AMU and the Marines is the 115 FMJ, Star brass and is labeled MATCH. I measured the muzzle velocity (MV) using the normal methods.